I don’t think you can do my job without having a passion for the environment. It’s not a regular 9 to 5 job, and when I clock off for the day I am still thinking about the environment around me. I am a Technical Specialist in Biodiversity covering the areas of Derbyshire, Nottinghamshire and Leicestershire. I oversee the work of our Catchment Officers who are tasked with supporting protected species, improving our watercourses and creating habitat. We do that in lots of different ways from working with different teams in the organisation and project work; to commenting on planning applications and flood defence consents; and carrying out work to remove Invasive Non Native Species (INNS). My days can look very different depending on the time of year. Throughout the winter my work is mainly desk based. From about March however, the environment comes to life and our team will be out and about. This is the time I enjoy the most and I try to spend as much time outdoors as I can. One of the biggest INNS projects I am dealing with at the moment is removing the dreaded Floating Pennywort. 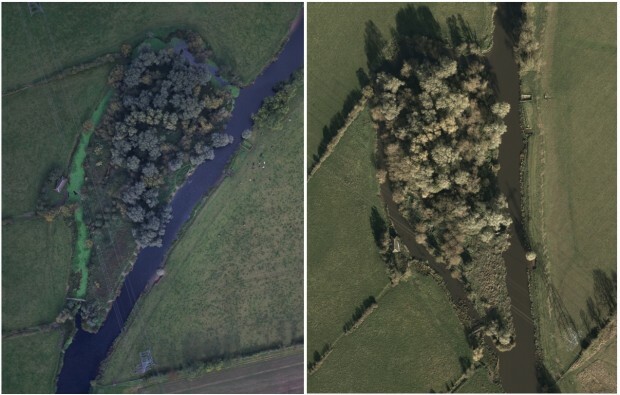 Around 96km of the River Soar and River Trent in Leicestershire have in the past been choked by this non-native plant. In some places it has looked more like land than water. The plant was first identified in Leicestershire in 2004, thought to be an escapee from a private garden. It soon got a hold, growing fast in our waterways and out-competing our native plants. It can grow up to 20cm a day and spreads to block out light for other aquatic plants. The problem is so extensive that we have been carrying out annual herbicide spraying and some removal of the plant since 2007, with regular herbicide spraying from 2010. This isn’t a problem that can be solved overnight but perseverance with regular and consistent spraying is having a big impact. Year on year we have seen a significant reduction in the spread of the plant. We have to keep returning to the site every year in order to keep it under control which takes time and money. In 2009, when no spraying was carried out, coverage jumped back up and the plant came back with a vengeance. It’s not just the Environment Agency that has been involved in trying to eradicate this problem. We have worked very closely with the Canal & River Trust who undertakes spraying on the sections of the Grand Union Canal. We have also worked with Leicestershire City Council, the local community and volunteer groups to remove as much as possible by hand. This has been mainly within Leicester City and around Cossington. We are already seeing the impacts of our work. Huge areas are now clear of Pennywort and the river is visible again. We have seen water lilies return in Abbey Park and fish are able to migrate as the water column is clear of the plant. 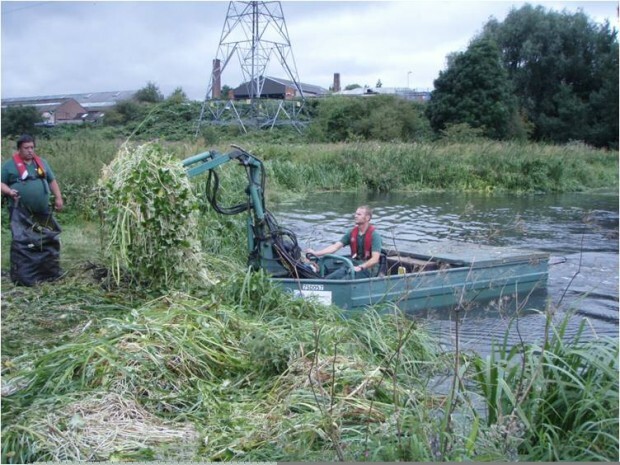 Clearing the Grand Union Canal has made it much more accessible for boats. Previously, we have received reports of cattle getting stuck after wading in to the river thinking it was land. Luckily we have not had that problem for a number of years now. It feels great to see the impact our work has had, especially when the area of Pennywort falls year on year. I would like to think that one day we will not have to tackle this species anymore on the River Soar - that would be a good day’s work! 'A' level student seriously contemplating a degree in Oceanography, who desperately wants some work experience which may help channel or clarify options. Also I would really appreciate some professional advice on my EPQ project; from reading the article on 'Bio-Bullies' sounds like you could help . I live on the Derbyshire, Staffordshire boarder, so I was very interested in the Lathkill Dale article too. 1- I believe the CRT have machines that collect weed; could one of those be borrowed. 2- I can't get local info on whether anythings being done about Pennywort in Foudry Brook, Reading, can you help? The River Frays in Uxbridge is nearly covered in this stuff now but the environment agency say they will do nothing. As a riverside dweller, all pleasure of being in the garden is going. It was lightly sprayed laser year which had no effect. Are there at volunteer groups to help? Cossington locks . The river is full of the stuff. Around the Devil's Elbow area of the Soar this Autumn more of this weed than I've seen for a few years. The Great Ouse at Offord Cluny , Cambs is badly affected by Pennywort . We have reported it to the EA via plant tracker and shown them personally . The sections of river which are non navigable are largely ignored , now bank to bank in places . Our members have lost areas to fish due to this weed . They complain they buy thier rod license but can't get a line in the water . We can't keep members if they can't fish ! See ousefishing.com what can we do ? I am Chairman of Offord & Buckden AS. Has anyone considered using it as a biomass resource. If it grows this quick it could be a valuable feedstock for anaerobic digestion. Maybe you could pay for its own control.